Innovative Intersections boost lane efficiency. A typical suburban arterial might carry about 700 vehicles per hour per lane. But if revamped to include innovative intersections, the boost might jump to 1,100 vehicles or more. So how is accommodating more cars with the same lanes transit friendly? The increased capacity doesn’t always need to be for cars. 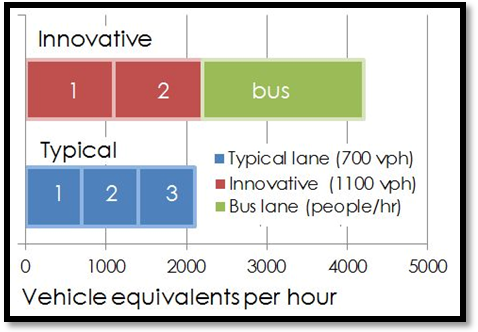 In this chart, suppose you have an arterial with 3-lanes each direction where each lane can carry 700 vehicles per hour per lane (blue), or 2,100 total. If it works out you can’t quite give up a lane, you might be able to get “parts of lanes.” Engineers usually want 12-ft lanes for anything signed at 40-mph and higher. But if efficient intersections reduce delay, then you might reduce speeds to 35 or less without hindering average speeds. And 35 mph is where a new 10-ft standard kicks in. That’s the best-practice width for walkable boulevards supported by the Institute of Transportation Engineers, Congress for New Urbanism, and National Association of City Transportation Officials (ITE, CNU, and NACTO). 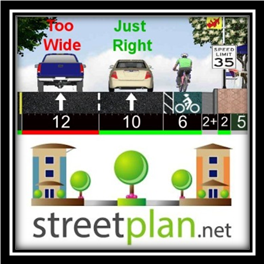 Try out StreetPlan.net, a free Complete Street cross-section design tool that uses “red/yellow/green” to guide you through context-based best-practices for speeds, lane widths, and other street attributes.